Tinker Bell has been reunited with her owners after a 70-mph gust of wind picked up the six-pound Chihuahua and tossed her out of sight. Dorothy and Lavern Utley credit a pet psychic for guiding them on Monday to a wooded area nearly a mile from where 8-month-old Tinker Bell had been last seen. The brown long-haired dog was dirty and hungry but otherwise OK. The Utleys, of Rochester, had set up an outdoor display Saturday at a flea market in Waterford Township, 25 miles northwest of Detroit. Tinker Bell was standing on their platform trailer when she was swept away. Dorothy Utley tells The Detroit News that her cherished pet “just went wild” upon seeing her. Tupperware parties but for pets: It’s ‘Pupperware’ time! First there was Tupperware parties. Now there’s the “pupperware” party. The concept is pretty much the same as Tupperware or almost any other product sold at home parties. Someone hosts a party and invites his or her friends and family to check out a product line. Only with these parties, the guest list doesn’t have to be limited to humans. Canine companions welcome! The Pet Party is being offered by Shure Pets, a national pet product company based in Chicago. Spending money on our household animals is at an all-time high. We may be in a recession, but we’re not cutting back on pampering our pets, according to figures from the American Pet Products Association. The group’s most recent statistics show that consumers in the United States spent $43.2 billion on their pets in 2008, up from $41.2 billion in 2007. Laura Macklin, sales and training director for the Pet Party, recently held a pupperware party at her west suburban home. “We even had a 10-week-old puppy come to visit, and we gave her a spa treatment. We put spritzer on her, brushed her all out, put paw balm on her paws and made her look really pretty,” Macklin said. Guests at Macklin’s Pet Party were shown Shure Pets’ lineup of products including Paramount Paw Balm, the Ulti-Mutt Candy Bar, Devine Canine and Feline Breath Mints. There also were a variety of collars and leashes to choose from, as well as beds for cats and dogs. Other products being touted include organic catnip, a variety of shampoos and conditioners and dog treats. Read more: Tupperware parties but for pets: It’s ‘Pupperware’ time! He is a third of the size of an average guinea pig, and weighs in at just a few ounces – but this tiny puppy could be a big deal when it comes to world records. 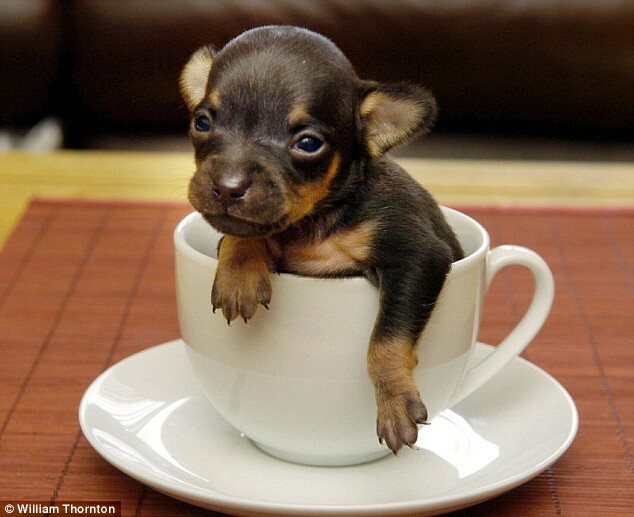 The miniscule chihuahua-Jack Russell cross – appropriately named Tom Thumb by its owners – is a serious contender for the title of being the smallest dog on the planet. Little Tom was born just three weeks ago as part of a surprise litter to mum Spice, a chihuahua. And he is unlikely to get much bigger – with some previous experience of rearing puppies through their early weeks, the couple are convinced that Tom is almost fully grown now. With his tan-and-black markings, Tom Thumb measures less than four inches from the tip of his nose to the end of his tail and only weighs about three ounces. Here’s a great story that reminds us that good things sometimes happen out of the blue! The woman seemed to appear out of nowhere. One minute, Justine Parnell was in the parking lot, sobbing a howl reserved for life-breaking moments. And Parnell told her. The puppy she had given her best friend — Tammy Horsley, who is dying from cancer — had Parvo, a deadly and contagious disease. The emergency animal hospital wanted $800 up front to treat him. So Zeus, the tiny Shih Tzu-poodle mix, was going to be euthanized. Before Parnell could tell the woman any more — that they had been there for six hours, calling everyone they knew who might have some extra money — the woman was running through the hospital door. Zeus’ leg had already been shaved to administer the lethal injection. But the woman found a vet tech and said Zeus was not going to be put down. “I’m paying the bill,” she said. Theresa FairLady is opening an insurance business next door to the animal hospital and was walking to her car for mouse pads on Sunday when she saw the woman crying. She knew she had to help her, but she can’t explain why. Horsley hasn’t believed in people for a long time, much less guardian angels. As a teen in church, she asked questions that were always answered with “have faith” and it annoyed her. The 39-year-old has been married and divorced three times, accumulating tattoos, piercings and a distrust of humanity. Her two boys live with their dad. She said one fiance died in a freak go-cart accident and the other was murdered in Las Vegas. She was in jail on drug charges when her mother passed away. A few years ago, she came home to Port Richey to take care of her ailing father. Parnell helped her get off drugs. Her life seemed to be getting better. Then she found the lump in her breast. Doctors told her the cancer had spread to her bones. It was stage four. Terminal. If there is a God, she thought, he surely hates me. She says she has stayed clean since the diagnosis. She gets chemotherapy treatments once a month, she said. But she didn’t want anything. “I just knew that dog couldn’t die,” said FairLady, 48, who is beginning a new chapter of her life. She used to be a professional baseball umpire and then opened an animal clinic in New Port Richey with her partner of 17 years. Together, she thinks, they rescued more than 5,000 animals, spending their weekends at shelters saving pets slated to die. But then they broke up. “It was devastating,” FairLady said. They sold the clinic. Her name used to be Theresa Cox but she changed it to FairLady last fall. She says it’s what people called her on the field, The Fair Lady. She stopped rescuing animals because it reminded her too much of her ex. But then there was Zeus. “He’s a miracle puppy,” FairLady said. 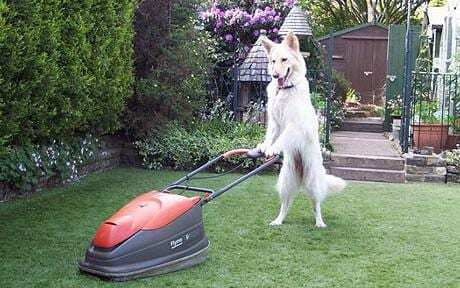 Hope, a white German Shepherd, is a dab paw around the garden as he shows off his skills with the Flymo at his home in Sutton Coldfield. The four-year-old, who was the winner of National Pet Month in April 2008, can also play the piano, claim organizers of a new talent show. His winning exploits are just an example of the skills being sought by the organizers of the inaugural Britain’s Most Talented Pet. The competition, run by The Ultimate Pet Show, is calling for entrants with sparkle – horses that sing, dogs that dance and cats that juggle. Twelve finalists will be selected to appear at the show at the NEC Birmingham on May 2.